Energy management specialist Schneider Electric wants Malaysians to use its online Efficiency Quotient tool to help improve energy conservation. 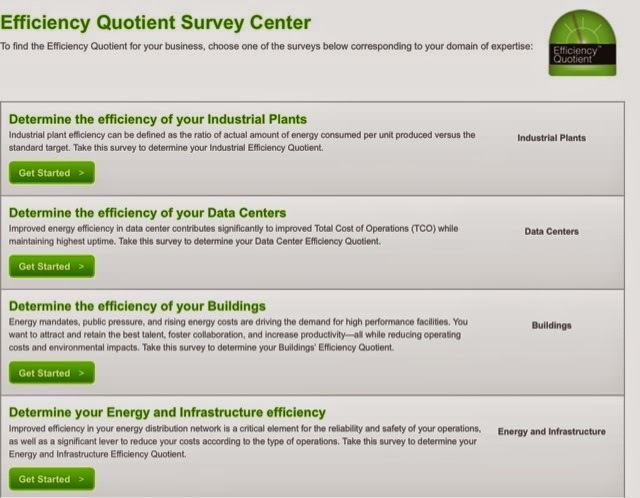 The quick and easy online questionnaire that was launched last year, provides customers with an energy management assessment, including cross-user comparisons and recommended steps for reducing energy costs and improving efficiency. Although the tool is just a fundamental guide (available at the company's website) but it is useful enough and it can help Malaysians conduct their own energy management assessment to compare their spending to other users. "According to the International Energy Agency, we are the third largest energy consuming nation in the Association of South-East Asian Nations and as our economy continues to grow, so will our energy needs." Upon completing the survey, the corporate and individual users will receive their energy efficiency 'score' on a rating of 1 to 5 and they can share and compare their scoring against other participant in the survey. Based on this score, Schneider Electric will provide them with recommendations and access to relevant educational materials including relevant white papers, links and other tools to help guide their energy efficiency improvement process. Interested users can consult Schneider Electric specialists to further assist them to plan and implement technologies, strategies and services to increase business performance and efficiency. This way, the assessment would be more suited to specific requirement of the orginasation. TheGreenMechanics: At the very least, the Efficiency Quotient tool will be useful in educating users about effective ways of using energy and help them identify easy steps to lower energy bills. I tried to register online today but the server seemed to have some issues and I got stuck at the country selection drop-down menu, even after several attempts.